Here’s a question that I received from a member of the Juice Up Your Wellness Business Facebook Group. “I need to come clean about something…I’m a CHN (Certified Holistic Nutritionist*) and I don’t like consulting directly with clients! I don’t feel like I’m even good at it, and I’m pretty sure my clients sense this from me. I’ve even stopped looking for clients, but I don’t want to stop doing my job altogether – I can’t afford to! As a Nutrition Professional or other type of Wellness Business Owner, you’ve probably realized by now that you’re not going to make the kind of money you’ve always dreamed of simply by acquiring coaching clients and doing 1-on-1 consultations. Trust me, my nutritional consulting practice was based solely on this model for many years, and the math never added up! I was constantly trading hours for dollars. Hey there skimmer! I sum all of this up in the vlog, including what additional income streams worked for me when I still had my nutrition consulting practice. Just being a rockstar Health Coach or Nutritionist (which you are, of course!) is simply not going to be enough to bring in rockstar-level dollars. That’s why I eventually moved my business online in 2015, added in group programs and e-products, and haven’t looked back. 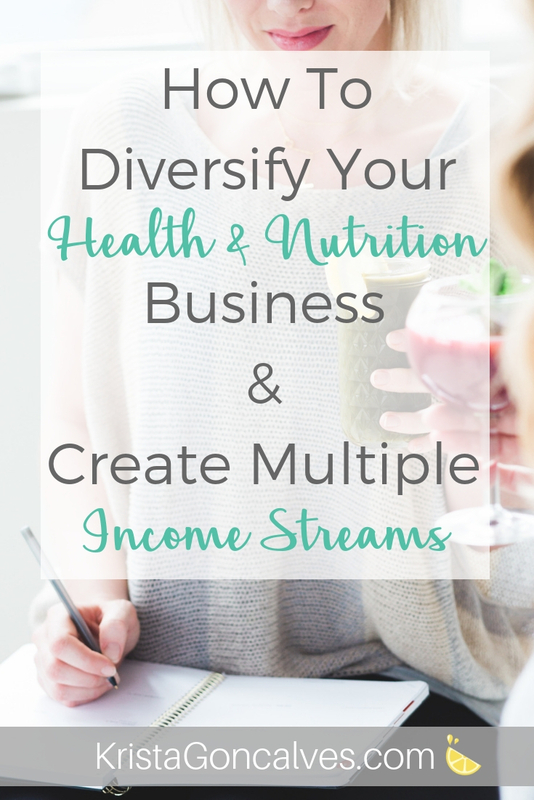 Even if you still practice in your nutrition business 100% offline, it’s my strong belief that you need to have part of your business online and be generating multiple streams of income. The same thing could be said of other Health Professionals & Wellness Entrepreneurs who might typically have a physical practice or clinic or work in a gym setting. This could mean selling digital products, creating online (or offline) group programs, doing affiliate marketing and/or expanding your services – corporate wellness perhaps? In fact, did you know that the average millionaire has 7 different sources of income?! Now, I’m not saying YOU should go out and pull in seven completely different ways of generating income into your business, especially all at once! Just choose ONE THING that you can really get behind, and do it well. Then, when you’ve nailed down your system for that ONE THING, consider bringing in another, and diversify your business using your tested system. When you try to stack individual clients, in order to meet a particular financial goal that you may have set for your business (or that your business needs to reach in order to be profitable) – it’s incredibly easy to get burnt out mentally, and otherwise. Plus, in my experience, it doesn’t bode well financially either. I mean, have you ever really crunched the numbers on 1:1 consulting? As I said, they just don’t add up! **This means if you sold nothing else and just saw clients, you would need about 290 clients per year to make $100,000 revenue. Umm, no thanks! Instead of 1:1 health coaching or nutrition consulting, here are some ideas for diversifying your wellness business – and your bottom line! ad income through your website – although I would caution you to NOT muck up a beautiful website with ugly ads! online e-courses using a hosting platform like Namastream, Thinkific or Teachable – watch for my new branding e-course coming up in February 2019! After learning the hard way for the first few years into my nutrition consulting practice, I stopped relying on my 1:1 client work and eventually added in workshops (some free, and then eventually some paid), as well as created a women’s hormone health group program that I collaborated with a Naturopath on and ran locally. This was a real game changer for my offline physical practice. 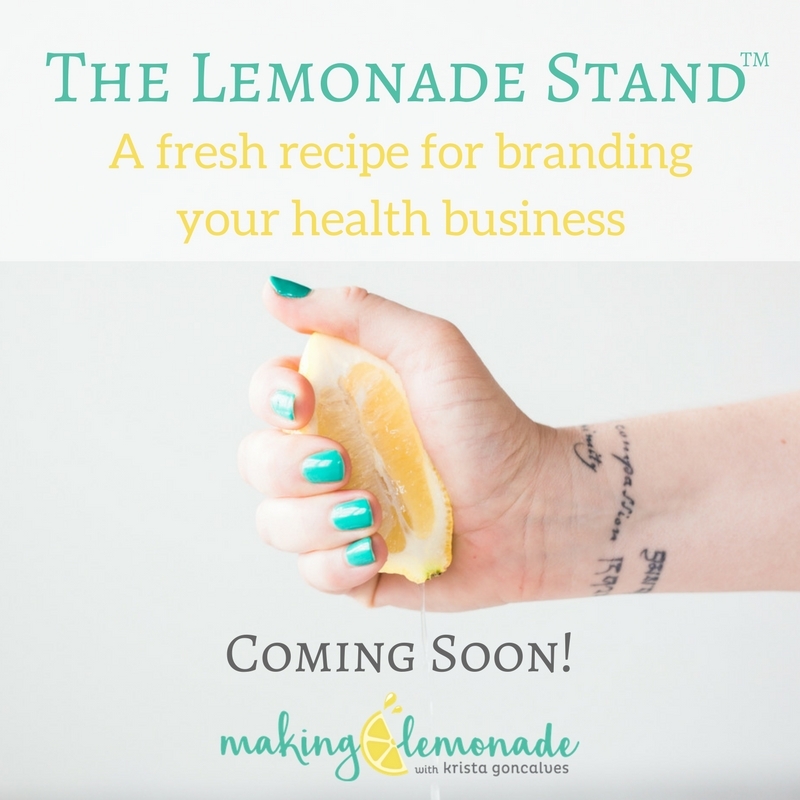 Then, once I brought my nutrition business 100% online (after a failed attempt at running a smoothie bar *eyeroll*), I started selling digital products, including meal plans (created with That Clean Life for Business), as well as e-guides – usually focused on women’s health & hormones — my favourite topic! Another consideration that I want to share is that when choosing which avenues you’re going to use to branch your business out with, don’t just choose things that you think you should be doing because it seems like everyone else is doing it with some success. Ahem, essential oil lovers, I’m glancing in your aromatic direction! I’m not saying you shouldn’t get into an EEO or direct marketing health biz, but just do what feels good, and what you feel aligned with – personally and in your wellness business. “What skills are you most sought out for? What do you absolutely love doing? Consider your main business venture for a minute, and identify the skills you use that have been generating the most income. If you’re a coach, clients might come to you for your expertise in a particular area, your ability to listen, or your penchant for tough love. Want to make sure you’re taking the necessary steps to SHOW UP in your business? NOW GO SHOW UP, STAND OUT — AND OWN IT!